Outstanding Parliamentarian Award 2018: President Ramnath Kovind presented the Indian Parliamentary Group (IPG), headed by Lok Sabha Speaker Sumitra Mahajan, on 01 August 2018, elected MPs from excellent Parliamentarians. Dr Najma Heptullah won the award for 2013, Hukum Dev Narayan for 2014, Ghulam Nabi Azad for 2015, Dinesh Trivedi for 2016 and Bhartruhari Mahtab for 2017. 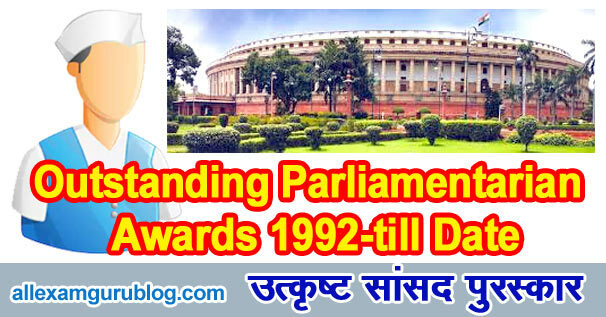 Shivraj Patil established the excellent MP award in 1992, who was the Speaker of Lok Sabha from 1991 to 1996. The Indian Parliamentary Group selects an outstanding sitting Member of Parliament after considering his/her overall contribution in Parliament. The first person to receive this award was Indrajit Gupta, whereas the first member to receive this award by the IPG was the Samajwadi Janata Party's Chandra Shekhar. So far 22 MPs have received this award.